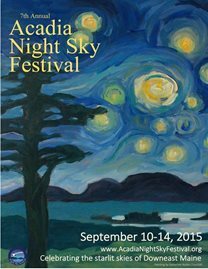 The search is on for the image to represent the 11th annual Acadia Night Sky Festival. All artists and photographers over the age of 18 are welcome to apply. To be considered for the festival’s 2019 poster image and marketing materials, all submissions must be original, depict Acadia and/or Downeast Maine’s stellar night sky, and be high resolution. The winning image will be featured on the 2019 festival poster, brochure, website and all related marketing materials. In addition, the chosen artist will receive two round-trip tickets between Bar Harbor and Boston, courtesy of Cape Air. The Acadia Night Sky Festival invites photographers and artists to enter its 2019 Poster Artwork Contest. 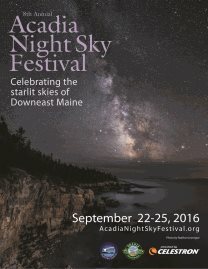 The Acadia Night Sky Festival is open to ALL photographers and artists at least 18 years old, regardless of residence or skill level. 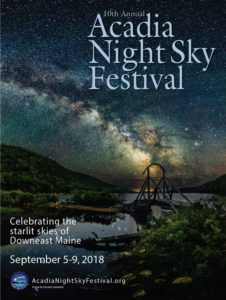 We are looking for striking photography or artwork that captures the night sky above Acadia and/or Downeast, Maine for use in our annual festival poster, brochure and marketing material. Your image should portray Acadia or Downeast, Maine in a recognizable way, with celestial objects included in the composition in a portrait layout. Ideally, images should include space for text to be overlaid in a way that will not detract from the image itself. Please do not include photographs that highlight only the landscape or only the sky. We are looking for a combination of the two that offers a reflection on the connection of our region to the dark sky above it. If you include people in your submission, you are responsible for obtaining any necessary releases from those depicted, and must be able to provide copies of those to the Acadia Night Sky Festival upon request. Entrants must ensure that all entries would be acceptable for a family-friendly audience, and will be disqualified for consideration by the selection committee if deemed inappropriate. An image caption must accompany each entry, and should include the subject of the image, the location that it depicts, as well as the medium and the name of the photographer/artist. Artists and photographers may submit multiple images for consideration, but provide individual captions per entry. All images must be submitted via email to acadianightskyfestival@visitbarharbor.com, and include the following: attached photo, name of photographer/artist, email address, caption information, and any other information about your submission. To ensure eligibility for the contest all entries must be at a high enough resolution for poster printing. For photographs, please submit photos taken from either DSLR or Mirrorless cameras with a minimum resolution of 12MP. For graphic design work, please submit artwork at 300 dpi or greater. For paintings or other non-digital media, please scan at 300 dpi or greater. Entries must be submitted in digital portrait format as a JPG or PDF file type via email to acadianightskyfestival@visitbarharbor.com. Previously published images may be submitted as long as you still maintain the right to grant us a license (see ‘Artist Rights’ below). 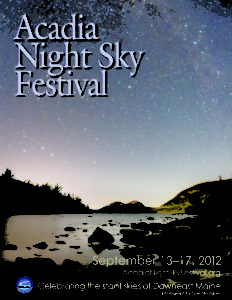 You also must be able to disclose to the Acadia Night Sky Festival when and where your image appeared. Images will be judged on composition, originality, ability to identifiably depict the Acadia and/or Downeast, Maine region, and overall impact. 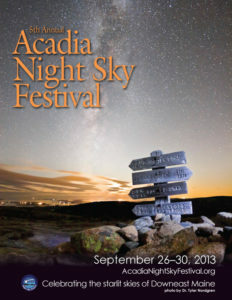 The selection committee is comprised of members of the official Acadia Night Sky Festival Planning Committee. The Acadia Night Sky Festival Selection Committee will determine winner eligibility in its sole and absolute discretion. All decisions made by the judges are final. Entries may be submitted starting at 12:01am EST on Thursday, February 7, 2019. The deadline for submissions will be 11:59pm EST on Sunday, March 24, 2019. The winning image and artist/photographer will be announced no later than Friday, April 5, 2019. The Acadia Night Sky Festival reserves the right to adjust any deadline(s) as needed for causes beyond its immediate control. The Selection Committee will sort through all entries to find ten (10) finalist images, from which the winning image will be voted on by the marketing committee of the Acadia Night Sky Festival. 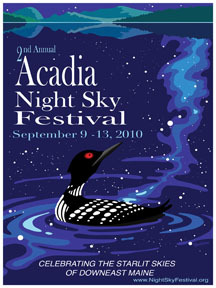 The winning image will then be used in the 2019 Acadia Night Sky Festival Poster, brochure, website, and other marketing materials. The winning photographer/artist will be credited and thanked at the opening keynote presentation at the 2019 Festival. The winner will also be credited and announced in press releases related to the Festival. The winner will also receive two (2) round trip airfare vouchers on Cape Air for travel between Boston, Massachusetts and Bar Harbor, Maine. The remainder of the top ten (10) finalist images will be used by the Acadia Night Sky Festival on its website and/or social media channels with proper credit given. If you do not wish to permit this use, and only grant permission for use if chosen as the winning entry, you must notify the Festival in writing at the time of image submission. The artist will retain all rights to any photograph or painting submitted. 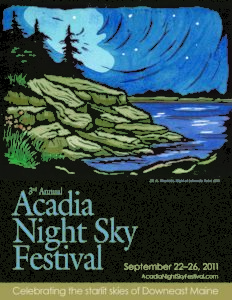 The artist will only grant the Acadia Night Sky Festival rights (as described below) to his/her image if chosen as the winning selection or one of the top ten finalists. If your image is selected as the winning image, the Acadia Night Sky Festival will contact you to confirm that you agree to grant rights to your image as described below. 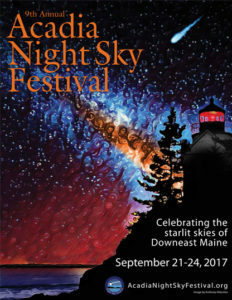 • Use the image for the promotion and marketing purposes of the 2019 Acadia Night Sky Festival, including but not limited to: festival poster, festival brochures, marketing materials, etc. • Use the image online in support of the festival’s mission. • Crop or edit the image in order to fit the style and design of the festival’s marketing materials. • Use the image in the Acadia Night Sky Festival’s non-commercial communications. • Provide your image to other individuals and organization for non-commercial use, including but not limited to: news stories, newsletters, reports, slide shows, displays, web pages, etc. • Use, in connection with the Artwork Contest, your name, city, state and country of residence in promotions and other publications. • Keep the files provided so that your image may be used to support the festival in future years. • Post and share your image on its website and/or social media channels with appropriate credit given (you may decline to allow this usage by submitting a request, in writing, to the Acadia Night Sky Festival) to be used in 2019 and future years. 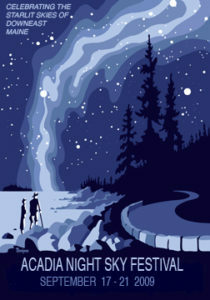 As conditions of this permission, the Acadia Night Sky Festival shall credit all images with the artist’s name when the full name is available. 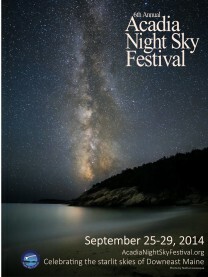 Questions about the contest rules can be emailed to acadianightskyfestival@visitbarharbor.com.